Wanna know what’s cooking here at Oxwall? You are in luck, since we’ve got a fresh serving of latest news from the dev kitchen! With the upcoming update we are taking an aim at Content Moderation. For quite sometime we’ve been looking for an opportunity to fix/improve the current flagging system (that was begging for an overhaul), and we finally found enough time to do just that. 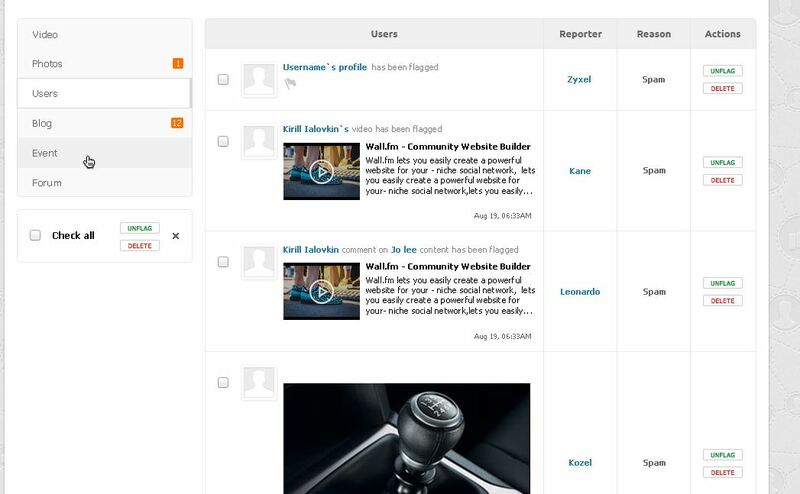 The new user-friendly interface will be more intuitive, and allow to flag Users, Comments, Events, as well as Newsfeed status updates. The option for the Admin to appoint Moderators for each type of content will remain in place. In unrelated news – let’s welcome a new major addition to the grand family of third-party plugins available in the Oxwall Store. That’s right, our cooperation with TopCMM bore fruit in the form of 123 Flash Chat plugin. So, if you ever wanted to add a live chat room to your site or play around with PPM/PPV, you’ve got it now. Proceed to the Oxwall Store to learn more and download the plugin now. Take this announcement as our seal of approval. There’s likely more stuff, and that’s quite a full plate, isn’t it? Still, our team is always excited and passionate about continuously improving the product, but only if the changes are consistent, healthy and gradually introduced. Well, ‘till next time, when we’ll take a more detailed look at some of the things in our plan. In the meantime, subscribe to our updates on this blog, Twitter, Facebook, and Google+ to never miss an announcement. This entry was posted in Misc by alina. Bookmark the permalink. Great changes to come, and the reporting users, comments etc is what is needed. Looking forward to the new upgrades and really excited about the new UI for both admin and user side. Would LOVE to see improvements in the instant messenger such as “Last Seen” etc. Also, improvements for the comments to be “Liked” as well, not just the posts. Is there any way to add the ability for “Pages” to be made for the community? We have people begging for this feature, and we do not like the plugin in the store of oxwall. Not worth the money, and we believe you guys can do an even better job than this plugin. 3. Each photo (in floatbox) social sharing ability by buttons. Do you believe that all of this should not be in the script? Exciting news =) I’m looking forward to see what you’re going to do with the interfaces and mobile version in the future. I was surprised to see how many of my few users are accessing the mobile version of the site, so any extension of its functionality is very welcome and definitely a good thing to focus on. I’m also curious to see what this mysterious CMS introduction is going to be about. Sounds like a good improvement plan in the future. I know of some decent plugins in the store for this, but how about smileys in the future, that allow you to add your own smileys for like blogs and all over site content? Also blog categories and group categories would be an awesome addition as well. like blog: site news, member announcements, contest news, poetry, rants and raves, as well with group categories: Teaching, Cooking, arts and crafts, etc just to name a few as a way to make categories available. Same can be applied to videos with categories. I know aron has a plugin for this called video pro as well. Also, a cool new free chat you guys got here lately is IFlyChat which is like facebook chat and ning 2.0 chat like they used to have. I am using it on my new network now. Go to a priced plan and you can create more than one public room. It’s also a free download. Please work on the mobile version first! 80% of my website traffic are coming from mobile devices! Bring an advanced mobile official App! is mobile version can able to access some page like blog , gift , forum , events , credits , links ?? By “enhanced mobile,” would this by any chance mean the addition of Editing your Profile (info and avatar) via mobile? One update added the Join option which was very important, and now the next one should add Profile/Avatar Edit – another important aspect. NICE WORK….BUT….To work on Mobile 1st would be great, most of my traffic comes from mobile, 90% to be exact and would love to have Forums available on Mobile. 1) Would also be nice to have in the chat messenger when talking to someone, show “Last Seen: The Time Here” and “Seen” or show a checkmark like facebook does so the other user knows they have seen it. 2) Also show when the users are typing, this way things can flow better and they’re not talking on top of each others messages and not able to keep up. Nice one, please try to improve the mobile view, its most important. Please will the updates be available this year? Yep, That’s what I hope. By the way, why suspend my account on oxwall.org? Please use on-site contact form to learn about and eliminate the reason. Very good news items. Waiting with excitement for the next update. Oxwall is an amazing alternative to others in the same genre. I’m very happy, thanks to all developers, you’re doing a great job.